« Good Days and Tough Days….no such thing as bad days! How refreshing to walk out of the house in the morning to fresh, crisp air. Days have been clear, warm (70s) with lots of sunshine. And, it looks like we have more of the same through this coming weekend. Monday there appears to be a chance of showers in the forecast. Spastic water the past few days. Monday we had no generation until 2:00 p.m. when it was to have ramped up. Full four on like gang busters! Yesterday it was to have been a low one for the morning then ramp up to eventually two units. Two units on in the a.m. at a full one or more, then down, then up….and on and on. Today, so far, it is a low one as projected, but the projection is for up and down water most of the day. Look forward to seeing what they have in store for tomorrow. Another new fly fisher was born Saturday. Thanks to her friend Terrie, who booked a trip with Carolyn for the two of them, Betsy is well on her way to becoming a fly fisher! It was a beautiful, crisp morning with very little wind and no generation. Just being on the water was a great experience Saturday. 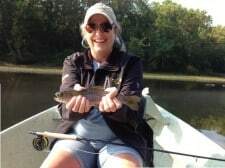 For a weekend, there were not even a lot of fishers on the water so it was very quiet and relaxing….other than a “yeah!” every once in a while when a fish made its way to the boat. Betsy went from a nice 1st fish to a beautiful 17 inch rainbow as the morning progressed. nice rainbows. Best patterns were the red midge with copper head and black wire, egg, and red San Juan worm. Gina was on the water with Scott and Cindy from Oklahoma. They worked hard, had a fun day, and caught a few fish on the black copperhead midge and the red midge. One really nice fish on when the water started rising, but it just kept right on going. Sunday, Stan, Jim and Carolyn took a party of six out. Whew! Another one of those “tuff” days. 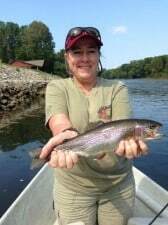 Carolyn’s ladies, Julie and Staci, caught one stripping the holographic green crackleback and a few more hitting the bank with a tan hopper pattern. Stan had Cole and Fred and they caught their fish on the P&P midge. Jan and another Fred were with Jim, and they caught several different patterns. 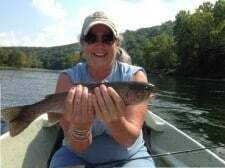 Monday, Wanda went out with Carolyn and for a while thought the river was void of trout. Finally, we pulled several out of a hole with the egg pattern. The good news was that it was again, a beautiful day to be on the water. Ron, from Texas, spent the day on the water with Stan. Slow bite but they managed to pull off a good day on the egg pattern. Better day Tuesday with the water running for Gina who took Kathi and Bill, from Kansas, out for half a day. Not much nymphing, but did best stripping the crackleback, JQ, and especially the tiger tail streamer. Another beautiful day! This entry was posted on Wednesday, September 24th, 2014 at 10:29 am	and is filed under Fishing Reports. You can follow any responses to this entry through the RSS 2.0 feed. You can leave a response, or trackback from your own site.